Today I took my old Ted down from the shelf in my bedroom where he watches over my sleep and asked him to model. He slumped in agreement. On my last visit to the art supply store, I impulsively bought a chunky rod of graphite and it has been lying patiently on my desk waiting to be called. I havent drawn with a pencil in ages but it seemed a good choice to capture Ted’s fur. It’s soft and smooth to draw with and the lines vary as I push down, seeking sharper edges sometimes, or just gliding with the broader facets of grey. My hands got rather grimy as I drew and I pulled out a pencil with an eraser tip to try to clean things up. The eraser couldn’t really eradicate the smudges but the pencil let me emphasize some finer details than the nub-nosed, crayon of graphite. My brain flipped back and forth while I studied the tones before me. Should I blend the graphite to make shadows or should I crosshatch like I do with a pen? As you can see, I never made up my mind but went back and forth. I do hope the drawing doesn’t blur away when I close the book. Maybe I’ll add a coat of fixative and a sheet of tracing paper to protect it. this is really a lovely and good idea! Drawing well-loved objects is very INSPIRING! In a former life I made teddy bears, and seeing yours makes me miss making them. What is your Ted called,does he have a name and curiously did Jack honour your name for him or did he choose his own? Very impressed you are keeping up with the daily drawing. Thank you, Jane, for posting this on Facebook! I wouldn’t have known about it otherwise! 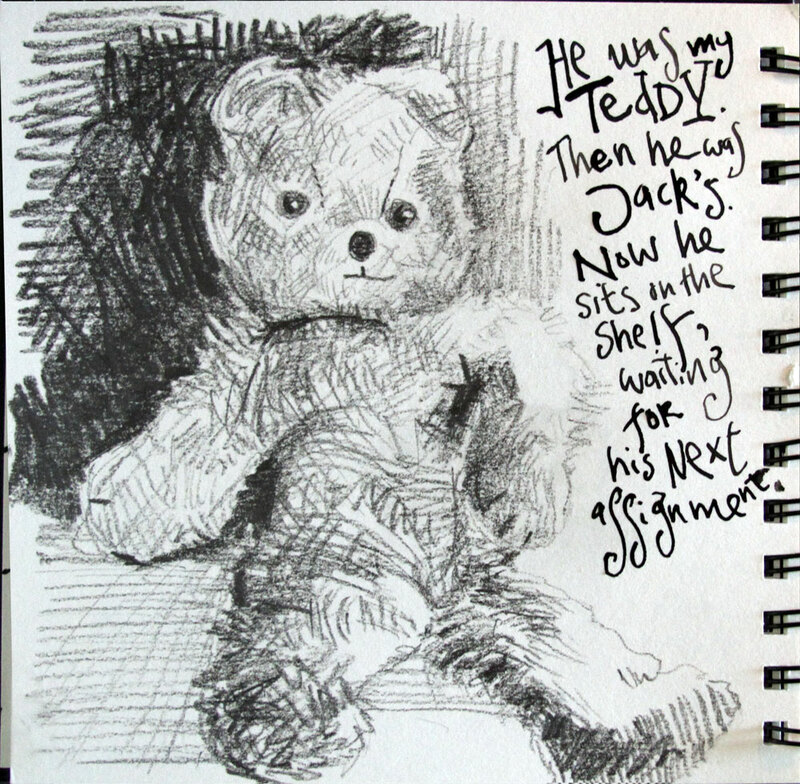 Interesting to read of your use of graphite and pencil…hope you were able to save the adorable drawing of Ted. My grandkids have two rather large stuffed animals (one’s a polar bear and ones a lion) that were my daughter’s, their mom’s, when she was their age. It’s great to see them continually being loved. They almost had a different life story when I once gave them with lot of other old toys to the local fire department for a call for gently used stuffed toys at Christmas time one year; but had second thoughts and went back to ask for those two back. Glad I did now. Ted is wonderful and obviously well-loved. Since I just joined this journey yesterday, I have only worked up thru’ #4, purses. Getting ready for #5 , the bed. Thank you for this opportunity and the encouragement to draw daily … something I don’t do often enough! Danny a sheet of glassine will work better than tracing paper to preserve Teddy’s portrait from smudging. The slicker surface won’t pick up and move the graphite particles. I like this look, though of course I’m partial to your dip pen work. Danny, I wanted to let you know I purchased a beautiful Lamy Safari pen with a fine point, extra nib (extra fine) and the tank to put your own ink in to use in place of a cartridge at Jetpens.com for quite a bit less then the $35 for the pen you were showing on the link. Shipping is free if the order is over $25 and they ship quickly. Give them a try sometime if you wish. Did you read that your graphite chalk is water soluble? Maybe that makes it harder to erase. Hey Danny, I’ve been following you and your blog for some time… it’s taken a while but first steps for me stepping outside of my graphic design box and into some freer expression using ink and watercolour… here is my first go – http://tinyurl.com/cnzmbtu a large size action figure I got when I was about 12. I wasn’t happy with the constant width line, so I bought a packet of PITT pens which includes a brush tip, so I’m looking forward to more making more pieces with more exciting line work!… thank you, you have been inspiring!